M is mystery at Enchantment Lake, by Margi Preus (book review) – unspoiled forest is motive for murders? a killer determined to own it all? Francie is not a NYPD detective, but she played one on television, and that’s more mystery-solving experience than the local sheriff seems to have! As deaths keep piling up (each by a different cause), even her eccentric great-aunts’ unique food combos (curry with a side of pickled beets, anyone?) can’t distract the teen from worrying that they will be the next victims. A departure from the author’s acclaimed historical fiction Heart of a Samurai (my recommendation here) and Shadow on the Mountain, this first book in the Northwoods Mystery series is equally well-written, with interesting characters and setting. Death by hot-dish? What casserole would you choose for your last meal? 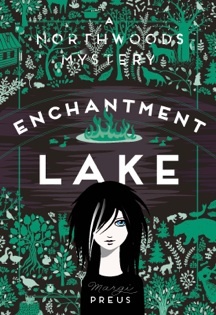 Book info: Enchantment Lake (Northwoods Mystery, book 1) / Margi Preus. University of Minnesota Press, 2015. [author site] [publisher site] Review copy and cover image courtesy of the publisher. My book talk: When her great-aunts say that they’re in danger, Francie leaves summer drama camp in New York City to find mysterious deaths and rumors of treasure in the remote Minnesota lake town where it’s assumed that the 17 year old orphan can solve all mysteries because she played a kid detective on TV. On the far shore of deep Enchantment Lake, eccentric Astrid and Jeannette tell Francie that city folks want a road through the peat bog so more mansions like the Fredericksons’ can be built. Property owners along the right-of-way have been dying oddly, and local real estate man Buck Thorne is pressuring their heirs to sell. At the latest victim’s funeral, a poisoned casserole kills Buck, and the suspect list grows since everyone in town owns a serving dish made by the local potter. What was Buck going to tell Francie about her long-lost mother? Why does Buck’s stepson need so much money suddenly? Can young law intern Nels help make any sense of these recent deaths?